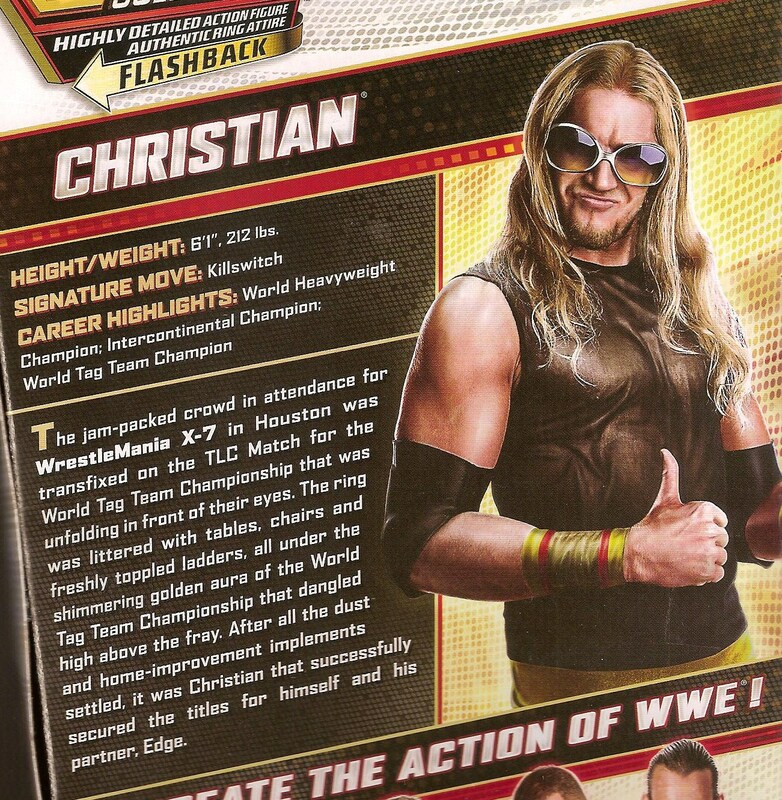 WWE Superstar (and one-time TNA wrestler), Christian, gets his first "Flashback" figure in only his third Elite release. I've never been much of a fan, but I did enjoy his time as Edge's tag team partner and since I already had Edge's Flashback, this was a must-have for my collection. FB Edge took a few missteps, but was overall a nice rendition of the Superstar's Attitude-era incarnation. How does Christian's throwback figure fare? I'll come right out and say it: this is "Figure-of-the-year" material, ladies and gents. Christian's FB release edges out his buddy's figure as the better of the two. The reason is the head sculpt. It's vastly superior to what Edge received. His hair is a separate, soft plastic piece that's been glued on. His face features a lightly sculpted beard, but it's been painted blond to bring out some. Christian is built on the slimmer torso with sculpted tights on the lower body. He comes with medium-sized elbow pads, which I feel are more accurate to his later and current look. I ended up switching the pads on mine for the smaller, Triple H type pads and I think it improves the figure. The paintwork on this figure is fantastic. I expected no less since FB Edge's own attire turned out awesomely, too! Christian has single tattoo, which honestly isn't that impressive as it's rather simplistic. The awesomeness begins when you get to his forearms. His three-tone wrist wraps are applied with gold, red and yellow paint and are sharply applied (another reason I prefer the smaller pads, they space out nicely from the wraps). The first FB Christian I picked up had a large chip on his right wrist wrap in the package. I was lucky enough to find a replacement a couple of weeks later. That was clearly a production error and not an across the board QC issue. Moving on, the design on his tights incorporates black, red and purple paint to create the intricate flaming cross logos. Each logo is tampographed across four body parts (hip, thigh, knee & lower leg) and Mattel made it a point to paint the upper leg pin to make each design appear seamless. Kudos to them! Finally, Christian's black boots feature a stylized "C" on the right side of each foot. These logos only required gold paint, but the they look great and to be honest is a detail I probably would have overlooked if they had been omitted. Not counting the removable elbow pads, Christian includes two accessories: sunglasses and his ring shirt. You should be aware there was running change during production and some Christians went out with painted lenses, while the rest (mine included) feature transparent lenses. The glasses are molded in clear (but cloudy) yellow plastic with a silver-painted frame. His ring shirt is very tight-fitting and is removable via the velcro strip down the back. It's hard to consider this an "accessory", at least in the way Mattel describes it on the package, because it's completely necessary in order to complete his ring attire. Basically, I equate the shirt to the elbow or knee pads on other figures. It would have been nice if Mattel tossed in a folding chair, though. 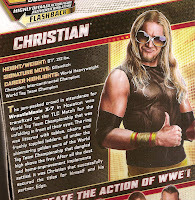 In all, Christian really did turn out great and having he and Edge together in their old-school duds fills out the Attitude era section a bit more. Some interesting notes, while I was waiting for E20 to hit retail in my area, Christian was the first figure from the wave to go up on Mattel Shop. Unlike the other, older Elites available at the time, he was listed at $14.99 (the others were $16.99). However, a few weeks later, Elite prices were raised to $19.99 across the board, including FB Christian. He was also, the cheapest E20 figure availble on Ringside Collectibles (initially). I don't know if retailers think he won't sell, or just that he's over-produced, but I currently have 5 of the 6 figures in the wave and hands-down, Christian is the best-looking. Now, that doesn't mean the other figures are bad, quite the opposite, Jericho and Rhodes are some of the nicest Elites ever! I'm just saying, Christian turned out awesome. If you already have FB Edge, then picking up FB Christian is a no-brainer. And if you don't have that Edge, this figure may make you consider tracking him down.